Hopefully yours, Connie: Infertile and ringing in the new year: anxious or hopeful? Infertile and ringing in the new year: anxious or hopeful? If you have been grappling with infertility in 2010, and perhaps for months or years before that, ringing in the new year is a time that is symbolically and practically filled with both hope and anxiety. Symbolically you are facing the new year without a baby in your arms, without a healthy pregnancy, and perhaps without much conviction that medical intervention is going to lead to parenthood. On the flip side of this coin, you also may have learned some lessons from your infertility experience and decided in the new year to try some new strategies. This leads to the practical dimensions of how 2011 can be different: can you and your doctor get clearer about medical expectations? Can you find ways to nurture yourself better through the inevitable anxiety of infertility? Can you and your partner discuss timeframes and begin to explore options in case a healthy pregnancy is not in your future? There's no question that months of medical interventions can take a serious toll on your hopefulness. All too often doctors will continue with the "same old, same old" without re-engaging you in a discussion of possible future steps to consider. 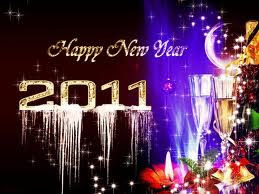 So for the new year, why not make an appointment with your physician to discuss a treatment time frame for 2011. This would include future treatment options, for how long to continue them, costs involved and statistics on healthy pregnancies for women of your age and with similar health conditions. Having this conversation will alert your physician to your expectation that you expect ongoing assessments of what treatment options are open after a reasonable time period of trying standard medical interventions. If you are currently being treated by your local ob-gyn, this might be the best time to discuss whether an infertility clinic could offer more comprehensive medical services (and more flexible days of the week for medical procedures and lab tests). And while you're thinking about timely medical interventions, the new year also is a time to think about whether you are getting enough emotional support, as the months or years of infertility take their inevitable toll. 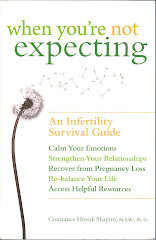 In my just-published book When You're Not Expecting: An Infertility Survival Guide, I offer a number of suggestions for how to access emotional support, ranging from how to communicate differently with your partner to ways of identifying a therapist or a support group. Even if you are not feeling a compelling need for an extra shoulder to lean on, now might be a good time to check out potential resources in your community, since it is best to have this information in advance of being assailed with feelings of desperation. Prevention is what you'll want to aim for in terms of your emotional health, since you will always cope better with your infertility journey if you have the capacity to absorb ongoing news with a resilient emotional perspective. So what if 2011, like 2010, progresses with no signs of a healthy pregnancy? Here, again from the perspective of your trying to exert some control, is the opportunity to discuss the "what ifs?' with your partner. Would you be open to adoption? Working with a surrogate? Learning about donated eggs, sperm, or embryos (please see my earlier blogs for information on these options). Whereas you might be saying "yes, maybe" now, some more research on your part will let you know how viable these options are. For example, some countries only accept applications from prospective adoptive parents in good health, of certain ages, in first marriages, etc. Some sources of donated eggs/sperm/embryos are highly questionable or ethically inadvisable. Some attorneys specializing in services for infertile individuals and couples have strong professional reputations, where others do not. Rather than wait until you are ready to take the next step towards parenthood, 2011 might be the year to investigate costs, restrictions and waiting lists. You may not be ready immediately to pursue these options, but you'll feel more in control if you begin your initial investigations (both emotioal and practical), so you can be aware of how much time and money you want to invest in current medical procedures. So, as you ring in the new year, admittedly with both hope and anxiety, perhaps you can take comfort in knowing there are some proactive ways that you can move into 2011 with new and informative resources. The key word for this new year is "resilience," as you strive for the best outcome possible in your quest for parenthood!